pharma discussion: Do you Know about Vented, 3 vent, & Non Vented Petri Plates?? Hidden Facts!!! Do you Know about Vented, 3 vent, & Non Vented Petri Plates?? Hidden Facts!!! What is Vent in Petriplates? 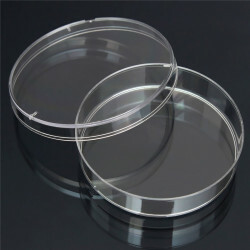 Vented Petri dishes have a small lip on the top edge of the dish that allows the lid to sit a little up from the bottom, allowing for some air flow. Non-vented Petri dishes allow the lid to sit more or less flat on the bottom. Standard Petri Dishes are always vented, so if the don't say vented or non-vented, you should assume they are vented. "Vented" means that the lid is slightly elevated above the base. This allows for good, plentiful air exchange. This is useful when you want to encourage evaporation, for example, when you want to use poured plates as soon as possible, and the plates themselves, or a liquid seeding solution, needs to dry beforehand. The basic design of the dish tends to maintain sterility because particles would have to go up and over the dish's wall to get inside, and this is rare in normal airflow. 3. Six Vented: Number of vent increases allows more gaseous exchange.
. With "non-vented" dishes, the lid fits quite flatly on the base. While it is not a hermetic seal, the space between dish and lid is extremely small. This results in even less potential for external contamination and a significantly reduced evaporation rate. For example a 60mm vented Petri Dish containing 10ml of agar medium typically dries out in 2-3 weeks; whereas, a similar 60mm non-vented dish typically lasts 2-3 months. Except those in very humid climates, prefer the non-vented dishes. Non-vented dishes provide sufficient air exchange for the worms to breath while greatly increasing the life of the dish.